Dan Emmett visited with Auburn Rotarians about his tenure with the U.S. Secret Service, which he chronicled in his book Within Arm’s Length: The Extraordinary Life and Career of a Special Agent in the United State Secret Service. The book narrates his 21-year Secret Service journey – from application, through service to Presidents George H.W. Bush, Bill Clinton and George W. Bush, to his retirement as assistant to the special agent in charge on the elite Presidential Protective Detail. 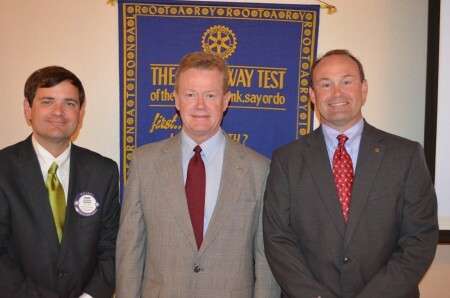 Pictured with Emmett is program host Ross Ryals (right) and club president David Reaves (left).